Next week marks 35 weeks so we have been hitting our to do list hard. Neither one of us are into crazy pink and when we bought our house last year, the house was a hot mess. There was a lot to be done and covering up crazy paint jobs/holes was part of that. This room is about 10'x10.5' and it was originally primary red and blue. Something was bolted onto the wall and required a lot of patchwork so we just went with fresh Benjamin Moore Dove White in Eggshell finish. 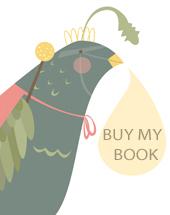 If you are a member of Pinterest you can view my "For Baby" board. This week our blinds came in and the blackout curtains were hemmed so we put those up this weekend. I'll try to put links for any item I can find links for. The first thing I found for the nursery was the bedding (Dwell Studio - Menagerie) and everything was a jumping off part from there. We got the crib (which changes into a day bed, toddler bed and full bed) from Costco. 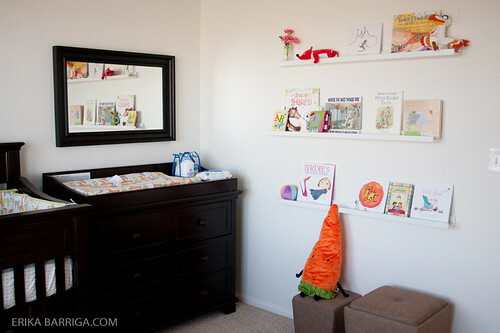 The dresser/changing table is from Costco as well. The changing table part comes off so it can turn into a dresser and hopefully last a very long time. The mirror is the Hemnes mirror from IKEA. Since the room isn't the biggest in the world, storing what we want has been a challenge. I love the look of books with their covers facing out but I couldn't find bookshelf/picture ledges that would do the trick. 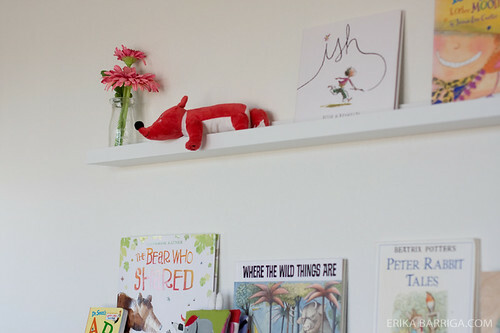 Then we came upon the Ribba shelves from IKEA and it was love. They work perfectly! The ottoman is a storage ottoman that came with another one inside. Purchased on sale from Kohl's. 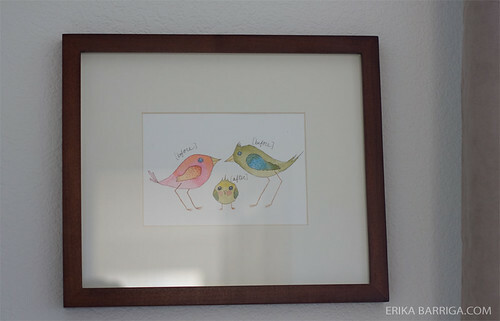 This is a watercolor painting I painted awhile ago, shows mama, dad and baby. There is a close-up down below. 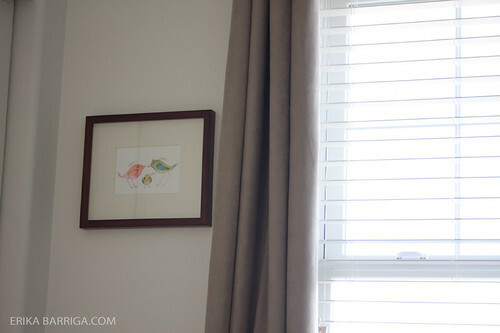 We found the creamy taupe blackout curtains from The Great Indoors. Had to get them hemmed since 84' was too short and 95' was way too long. 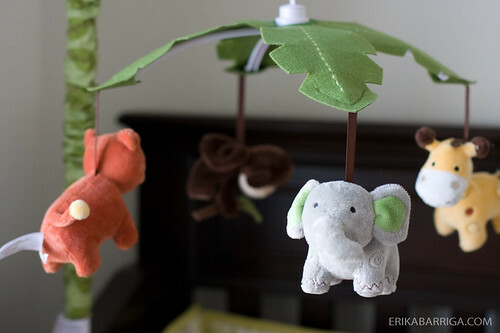 This super cute jungle music mobile is wind up and plays Brahm's Lullaby. Purchased at Babies R Us. I think this is the second thing we bought after bedding. 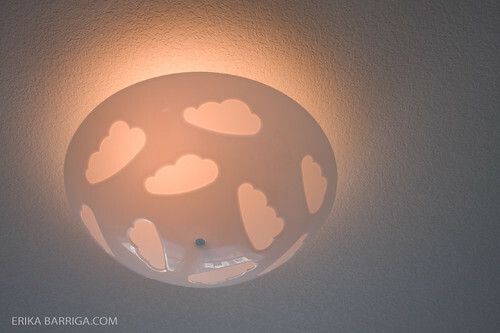 Love this cloud lamp from IKEA. 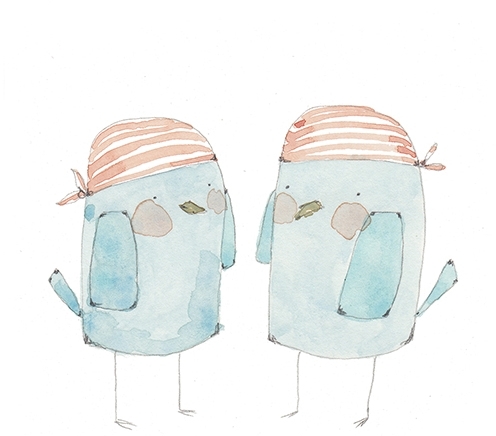 So we are SO happy with how things are coming together and I just had to share. My parents came over this weekend and helped us measure, level and mark so the mirror and bookshelves look just right. Still getting used to having a house and being able to do whatever you want to the walls. 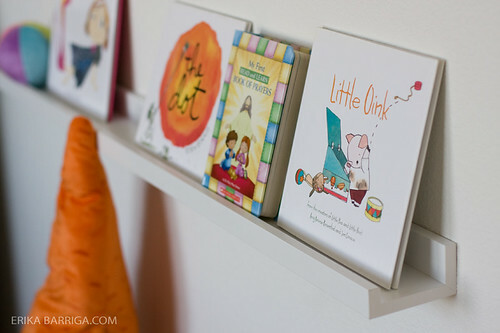 Ledges/shelves are my new favorite thing. We bought one more shelf that is deeper, but now I can't think of where it can go. We have other bigger toys like that carrot that we'd like to put on a deeper shelf. Still choosing a glider and the closet only has like 4 outfits on teeny tiny hangers.